In March 1855, SHIMAZU Nariakira pardons those who were involved in O-Yura Sōdō, an internal trouble in the Shimazu clan and Ōkubo Jiemon returns to his home. 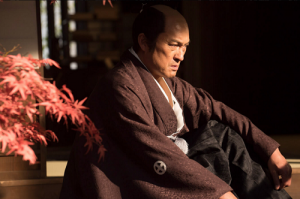 Though he is delighted that his children have grown up, the deaths of Saigo Kichibée and Masa makes him feel sorry. And his son Shōsuke who realises that Hisamitsu is interested in foreign affairs borrows some books related to them. Besides, he inserts a letter to thank him for making efforts in pardoning the arrestees of the trouble in one of them. 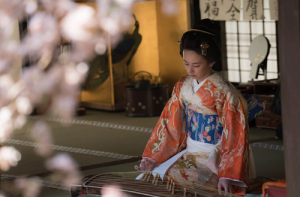 Atsu hime has lived in edo for two years but the wife of Iesada has not decided yet. 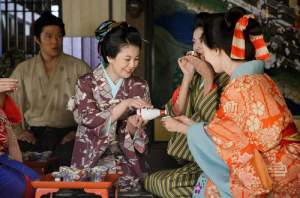 Ikushima who doesn't know the truth and distinguishes herself as a wife of a merchant and visits Isodaya to spy the attitudes concerning the marriage of other domains. And she meets Honju-in, mother of Iesada and Utahashi, nurse of Iesada and emphasises that Atsu hime is healthy and has a good luck. Meanwhile Kichinosuke receives lots of money from Nariakira and invites the superior vassals to support making Yoshinobu become next shogun. However, ŌYAMA Kakunosuke and ARIMURA Shunsai suspect him who returns late with the smell of sake but he tells them nothing about it. Honju-in decides to make Iesada choose his wife. Her maid puts the portraits of the ladies who are the candidates for his wife on the floor and tells him to choose one. However, he points at II Naosuke who stays in next room with ABE Masahiro. Then he goes through the room into the garden and grieves the death of a duck he keeps. 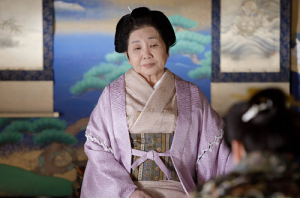 Then Honju-in tells him that everybody has his/her life but he can marry a healthy and lucky lady and show him the portrait of Atsu hime under his foot. He decides to marry her then while Naosuke is dissatisfied with such a method. But Honju-in tells him that he should know his place. Their wedding will be celebrated next December but Kichinosuke remembers Nariakira's words that will be unhappy. Atsu hime is informed of the decision and thanks not only Nariakira but Kichinosuke also. After that, Ikushime listens to the conversation of Nariakira and Kichinosuke about the real intention of this marriage. Then she decides to train Atsu hime to make strenuous efforts to support Yoshinobu in Edo Castle. Kichinosuke thinks that she trains her so hard but she ignores him. 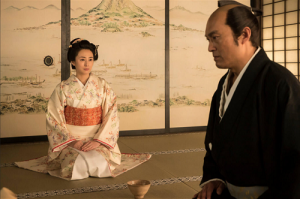 After that Nariakira tells Atsu hime that Iesada it too weak to have a child between her and what she should do is persuading the ladies in Ō-oku to support Yoshinobu for next shogun. She says that she could be an adopted daughter thanks to Nariakira so she will accept her fate for him, for the country and for the people. But in October, a big earthquake (Ansei no dai jishin) hits Edo. Kichinosuke confirms that Nariakira is safe and then visits the room of Atsu hime. In her room, he saves her from a falling piller. Then Atsu hime asks him to bring her to somewhere and stay there with him with the just two of them. Kichinosuke prepares himself but she knows it is impossible. She just wants to learn whether he minds her or not. Then Ikushima comes there and Atsu hime says to him when she leaves there with her. 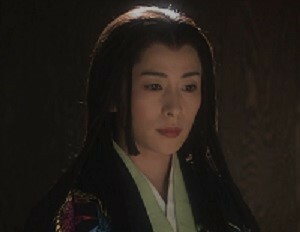 (*) He survived his two wives and then he married for the third time to Atsu hime. (**) I wonder whether Kichinosuke really thinks that he can go to somewhere with Atsu hime or not. ŌKUBO Jiemon Toshiyo was a samurai who served Satsuma domain and a father of Ōkubo Shōsuke, later Toshimichi. He was born in 1794 and became the head of the Ōkubo family in 1821. He left Satsuma for his post in Okinoerabujima Island two times and had two daughters between a local woman called Fudē. 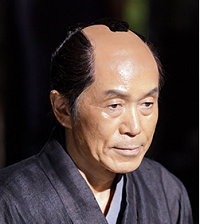 After returning to Satsuma, he was involved in O-Yura sodo in 1849 and was exiled to Kikaishima Island. He was pardoned in July 1854 and went back to his house. He is said to have been a fat and fair-skinned man and left his children alone but told his son not to act despicably. And later he made his daughters born between Fudē marry suitable men. He died in 1863 at the age of seventy. In this series, he is described as a mild-mannered and brilliant man who expects from Shōsuke. Before being exiled to Kikaishima Island, he has a sumo match with him and promises him to meet again. She is a fictional figure. She served Yu-u hime as maid and accompanied her when she goes to Kai from Suwa to become a concubine of TAKEDA Harunobu (Shingen). But it is decided that Yu-u hime moves to Suwa and then she accompanied her again and served her and her son Shirō, later TAKEDA Katsuyori. She is a calm and thoughtful woman and supports her mistress who is prideful and strong-willed. When she dies of tuberculosis, she weeps bitterly. Then she is offered by YAMAMOTO Kansuke to serve him but she hopes to serve Shirō and thanks him for his kindness to Yu-u hime. 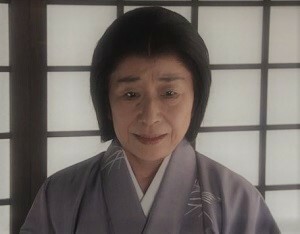 She was an elder sister of NAGAO Kagetora (later UESUGI Masatora then Kenshin) and married NAGAO Masakage. She gave birth four children between him includes Uesugi Kagekatsu. And she was a woman who recommended HIGUCHI Yoroku, later NAOE Kanetsugu as his page. She married Masakage in 1551. After his death, she became a nun and was called Sentō-in. Then she lived in Kasugayama Castle but left there temporarily because of Otate no Ran, the internal troubles in the Uesugi clan after the death of Kenshin. After that, her son Kagekatsu succeeded Kenshin as the head of the clan and she returned to Kasugayama Castle and lived there again under his protection. When he moved to Aizu and then Yonezawa., she went along with him and died in 1609. she was over the age of eighty. In this series, she is called Momo though she is said to have been called Aya in reality. In her childhood, she often plays with her brother Kagetora and later she admonishes him who tends to be so idealistic. And she accepts the marriage with Masakage for the future of Echigo. When Masatora, former Kagetora participates in the Fourth Battle of Kawanakajima, she prays his good fortune in battle with Unomatsu, later Kagekatsu.